MisMatch. The feet is not Indian. MisMatch. 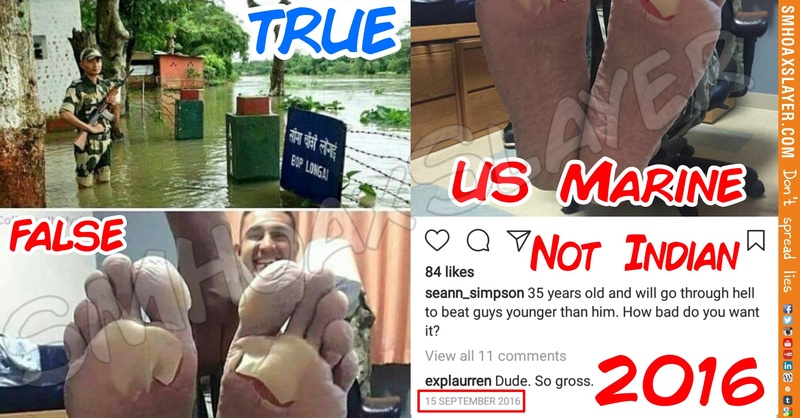 This set of two photos is viral claiming the feet belongs to the BSF Jawaan standing in water in left and is result of standing in water for long. The photo of the BSF Jawaan standing in water is genuine, tweeted by BSF verified account. Rain or snow #Bordermen stand guard unflinchingly. 35 years old and will go through hell to beat guys younger than him. How bad do you want it? ← A message which our soldiers were conveying through a photo is changed. Isn’t it an insult to them ? Did Kangana Ranaut leave India and is a Pakistani Citizen now ? These viral images of burnt animals are NOT from Bandipur Sanctuary fire. February 26, 2019 Shoubhik Ghosh Comments Off on These viral images of burnt animals are NOT from Bandipur Sanctuary fire. September 10, 2018 Hoax Slayer Comments Off on When Congress AICC Secretary fell for a parody account to make fun of our Defence Minister.